And at my discretion, I award a 1/2 WOWS to a worthy player on the losing team. 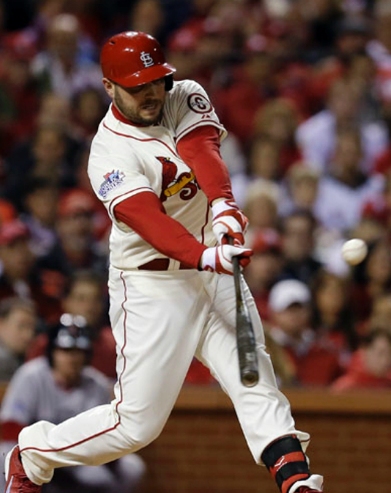 Matt Holliday went 2-5 and drove in 3 of the Cardinals 5 runs and scored another as they topped Boston in an bizarre 5-4 win in Game 3. Trevor Rosenthal let up a seeing eye hit and little else, striking out 2 in 1 2/3 innings and earning the 5-4 victory for the Cardinals. Xander Bogaerts tripled and scored the Red Sox first run and tied the game in the 8th giving Boston fleeting hope in their 5-4 loss to St. Louis. Felix Doubront gave the Red Sox 2 critical innings of shutout ball, getting the game tied into the 7th inning. It wasn’t enough as St. Louis won 5-4. This entry was posted in Uncategorized and tagged 2013 Boston Red Sox, 2013 World Series, Boston Red Sox, Felix Doubront, Matt Holliday, St. Louis Cardinals, Trevor Rosenthal, Who Owns the World Series?, wows, Xander Bogaerts. Bookmark the permalink.